Democracy and human rights in Turkey are deteriorating at an astonishing speed. Wholesale abuses of the rule of law and human rights – ongoing since the imposition of the state of emergency following the July 2016 attempted coup – have become even more grave in 2018. The trials of academics and journalists which began in 2017 are now being concluded and devastating sentences are being handed down. Two academics, Onur Hamzaoglu and Serdar Bascetin have been imprisoned for calling for peace. On 16 February, writers Ahmet Altan, Mehmet Altan & Nazli Ilicak were sentenced to life in prison on groundless charges and in defiance of a Turkish Constitutional Court decision. The People’s Democratic Party (HDP), the third largest opposition party in the country, is under enormous threat as many of its parliamentarians and local representatives have been detained and imprisoned. The trials of the co-chairs Selahattin Demirtas and Figen Yuksedag are largely censored by the mainstream media. Many civil society organizations, including Halkevleri, the Turkish Medical Association, are threatened through the detention of their members. These cases have profound implications for the European Court of Human Rights where some 100,000 cases from Turkey have been filed. This second joint event brings together lawyers, journalists and political representatives to share their observations on the trials of the journalists, academics and parliamentarians. 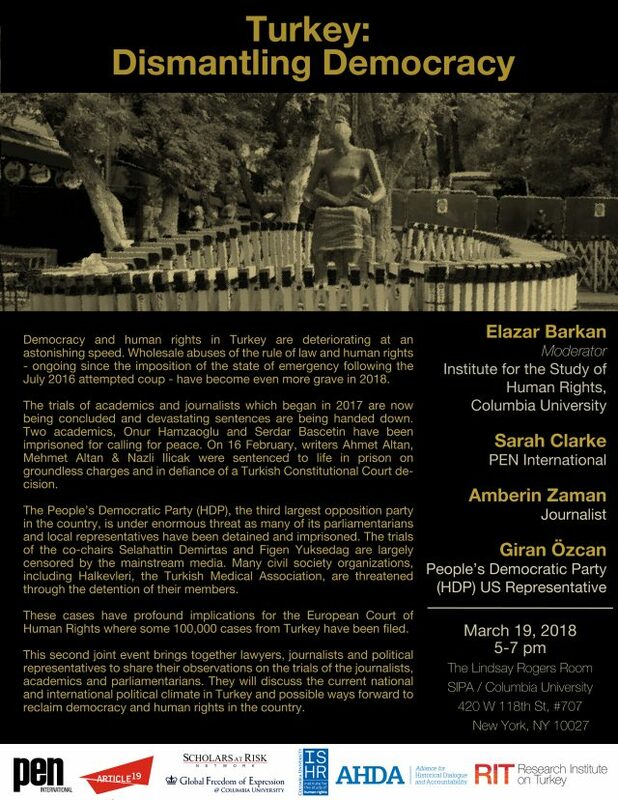 They will discuss the current national and international political climate in Turkey and possible ways forward to reclaim democracy and human rights in the country. There will be live streaming.